Tired of the same old coleslaw? This recipe was a big hit at our family's Father's Day celebration. We all gathered together (and by all I mean me, my husband, my son, my parents, my sister, my husband's parents, my two brother-in-laws, my sister-in-law and her four kids) to visit and enjoy the day. It was one of those parties where everyone brought a dish. My dish happened to be coleslaw that I first made on Mother's Day. How fitting to make it again on Father's Day, right? Well, this was the first time my husband's family was experiencing the salad and I'm thrilled that they loved it. The dad's were especially fond of it which made me even happier! 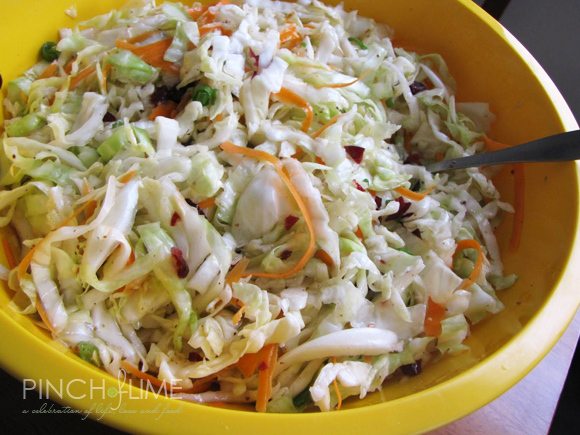 This version of coleslaw is different than the others because it's based on a vinaigrette. There's no mayo to make it heavy so it's a very light side dish that goes great with burgers and dogs on a hot summer day. 4. Mix dressing ingredients and refrigerate until ready to use. 6. Drain apples and mix with cabbage, carrots, onions and cranberries. 7. Add dressing and stir well. 8. Refrigerate coleslaw for at least 4 hours and serve.